Summer weather is upon us and even though it brings delight to some, for my husband, it can instigate drudgery. You see, he has a very long daily commute. And, since the A/C in his car broke over a year ago, with no funds to repair it, he gets to make a lesser-of-two-evils choice each day: suffer in the sauna of his car for over an hour home or roll down the windows to breathe in some not-so-fresh, but, hopefully, cooler, traffic-fume-infused air. To my husband’s credit, he usually endures such hardships with little complaint. Yep, he’s a champ about it. So, what do I do to reward him? Some nights, I make him get back behind a wheel soon after he gets home. Now, I know, this doesn’t seem very kind of me. But, trust me, it is. On many summer Wednesday nights (or, to be honest, many in the past, but only on July 20, August 10 and August 24, from 6:30 to 9:30 p.m this year, unless more funding comes through for Project Arts), I encourage my husband to roll out of bed early enough to “beat the traffic” to work, get his full work day in and be home by the dinner hour. When he gets home, I have strollers, a blanket, a picnic dinner and a bag of jammies packed into our trunk. Then, I buckle the kids into the van while Daddy changes from his work clothes to his comfy clothes. Once Daddy joins us in the van, he basks in the A/C (which still works, thankfully!) as we head over to the Jenny Grist Mill parking lot in Plymouth, where we break out the strollers and give Daddy a much-needed stretch of his commute-weary legs by walking the Pilgrim Trail along the Town Brook, through Brewster Gardens and over to the waterfront. Along the way, Daddy gets a chance to shout out some work and commute frustrations by testing echoes under two “Hello Bridges” with the kids – a tradition that began a few summers ago after we had read our children the Winnie-the-Pooh story where the characters shout into a log and have it echo back to them. Finally, we claim a blanket space in front of the stage at Project Arts free summer concert series. We dance. We sing. We run about. We climb trees. We walk over to see the Mayflower and the pirate boats. We meet friends. In short, we help Daddy bust away from the desk-and-drive drudgery of his day and transition into the pleasures of dinner, dancing and delight near the sea. Later, as darkness settles, Daddy and I cuddle the kids, breathe a happy sigh and enjoy a vacation-like moment, despite it being a midweek work night. The sun setting. The moon rising. The stars twinkling. Boat lights reflecting in the harbor. Music in the air. Smiles on our faces. The perfect panacea for a long commute. 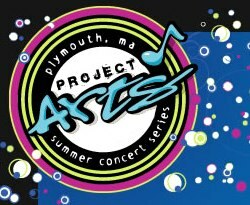 Project Arts has become a welcome summer staple for our family. We are disappointed that they are running an abbreviated schedule this year, but have already begun enjoying some alternate, venues on the weeks that there are no Project arts concerts. We might also take in some of the Thursday night summer concerts on the town hall lawn in Middleboro and would like to know about other venues. Do you know of a free concerts or family friendly event? Please share in a comment. Also, I’d love to hear a word about what traditions and venues make your summer more palatable even in the face of life’s more mundane necessities.